Last half term of 2013 was very focused in the Christmas concerts, in the school and in the church, singing not just in English, as well in Spanish. 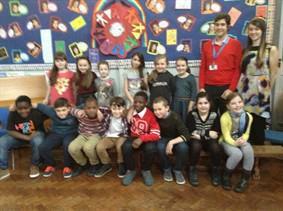 Our Spanish Christmas carols were “Campana sobre Campana” (Y5/6) and “La Marimorena” (Y3/4). After our successful concert we were invited by Alma Park Primary School to take part in its concert, singing Silent Night. I share here a picture from this day.